Covered in snow, mountain in background. "Atlin, BC, 1899"; First Street. "Boundary line on Chilkoot Pass, Larss and Duclos photo"; boundary at the summit of the pass. "Discovery Gold Rush 1898, pop. 10,000; Discovery 1960, population 2, Atlin, Northern BC." "Discovery Mine on Pine Creek, Atlin District, BC"
"Dog team at Goat Pass, the summit of the Ground-hog Range, Cassiar Division". "Dominion Government office and stores, Bennett, BC". 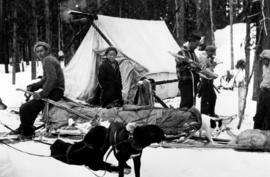 "Exhumation of the bodies of the tramway men buried in the snow slide on Chilkoot Pass, April third, 1898." 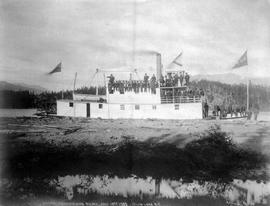 "Gold dredge on gold run, Atlin, BC." "In a tight corner"; climber is H. Pidgeon of Wrangle, Alaska; Mr. Stanfield drowned in the Stikine River 22 Sep 1899. "Keystone driller in operation on Spruce Creek, Atlin." "Moose on the Ground-hog Range -Cassiar district; Darby and Joan uncertain whether to run or to stay and investigate the new arrivals". "Moose on the Ground-hog Range, Cassiar district; moose at bay with one of the dogs of the survey party seen in the distance". "Moose on the ground-hog range - Cassiar District. They decide to leave the Survey party but leisurely in single file". "Moose on the ground-hog range - Cassiar district, a last look back before disappearing in the tall timber". "Nanuk at fly camp from where we hunted sheep."